Good morning, Friends! It's good to know that the weekend is getting closer! It snowed a good part of the day yesterday and it's supposed to continue through Friday! At least it seems to be melting and not accumulating. But it is pretty cold this morning. I do hope my friend Sherry will be able to drive over the mountains on Friday! I just love this. Love. Nothing else to say, there's just something about it! Thanks for playing at Fab Friday! I love this layout! 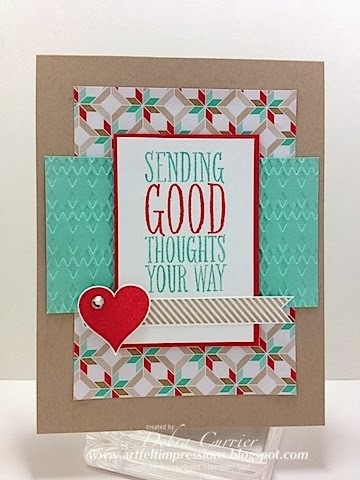 What a great design to show off a larger sentiment! Great job combining our challenge colors! Thanks for sharing at Fab Friday! Very cute card!! Love the long pennant!! And the heart is too cute!! Thank you for joining us at Fab Friday!! !